Despite playing in the Third Division for the first time Aston Villa's supporters stuck with them. Their average home League attendance of 26,123 was better than 9 clubs in the top flight. Aston Villa also became the third side from Division 3 to reach a League Cup final at Wembley. 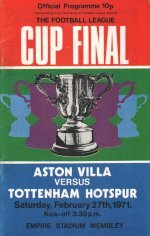 But unlike QPR in 1967 and Swindon in 1969 Villa were beaten, 2-0 by Tottenham Hotspur.